Also, some of the justification for why we had that particular SL had changed. It was not a particularly fine example of the breed, largely because of the paint and some (mostly) surface rust. What it was good for was year-round driving. We had no qualms driving it in the snow, and it actually was pretty good at it, when equipped with studded snows and some weight in the trunk. However, now that we have a son she doesn't drive a 2-seater convertible very often. Almost all of her winter driving is now done in the SDL. So, at this point in time a nicer SL for her was not out of the question. And, she really did prefer the feel of the seats in my '86 560 SL, and she did like its greater horsepower (hey, who wouldn't?). And let's not forget the fact that I'm already swamped with projects, so the extended rolling restoration that was her 450 was starting to get a bit old. It'd be nicer to start with something a bit better, something that she liked a bit better. While it's difficult to justify having two SL's now, I really like having His-N-Hers convertibles. 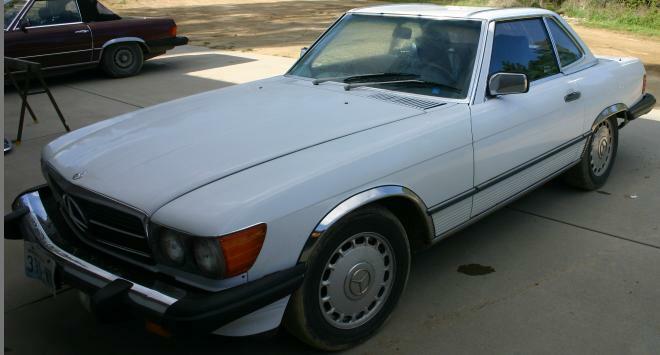 Enter a decent-looking 560 SL sitting in a local lot with an attractive starting price on it, and some really foul winter weather. (Not the best time of year for selling a convertible.) We'd had a good year, so there was some spare money. It was white with a blue interior, which is not what I'd want. However, it wouldn't be for me, so I stopped to look at it anyway. 92000 miles, around where they all seem to be. (What's up with that, anyway?) Tacky dash mat rug on it, which is no surprise because of the blue interior. Blue dashes are always cracked. Bozos had covered up the ACC temperature sensor with it. Duh! The mat has to go, she hates them as much as I do. Living with the cracks would have to be better. The leather was in good condition, a bit worn but nothing bad. Carpets good, etc. It had a nasty-looking light-show Sony stereo in it, with big speakers cut into the rear deck. (That'll have to change, she hates that kind of stereo as much as I do. The speakers will probably stay, though.) Big cell phone screwed to the storage tray, that'll go too. No signs of rust or wrecks, generally it looked pretty good. So I took her by to see it the next day. We got the key, and started it up, no problems. Central locking worked, etc. ACC seemed to act like it wanted to work, though the center vents don't shut off. (Yikes! I know what that means. But she prefers heat to come out of them, so I might be in trouble if I fixed it.) There are two new brake discs in the trunk. Windows work, as does the antenna. Oddly enough, the fog lights are missing. Also, one front turn signal housing is badly broken. AC had been converted to R134a. Yuck. I again ask her what she thinks of the color, etc. She gives it a passing grade. In a reckless mood, I went inside and made him a cut-rate offer. A bit of back-and-forth and we'd settled on a price before Jill even knew what I was up to! The car is supposedly a local car, and we'd be the second owners. The condition of the car looked like it was very well kept up until recently, when they probably got tired of the car and stopped maintaining it. I'd say that it is in overall much better condition than mine was when I got it, and for much less money (a few years later, of course). Certainly it is in much better condition than her 450 SL was in the beginning, although now the differences are pretty much down to what is inherent in equippage between a 450 and a 560, and the condition of the paint and upholstery. Key in hand, I drove off. Sort of a belated test drive! The car ran well, no problems in its acceleration or handling. Brakes were soft, though, and the brake light was on. We were only going a couple of blocks to the bank so as to cover the check, so while there I popped the hood. No brake fluid was visible in the tank, which explained the soft pedal. I went next door to the liquidator's and bought a half-priced bottle of DOT 3 and poured it in. The light went out. Also, braking was normal after that, so the low fluid episode hadn't gotten air into the lines beyond what would self-bleed out upwards. I have no explanation for the odd brake situation, but I'll keep an eye on the fluid level. There are no obvious signs of leaks. There may be some minor throbbing of the brake pedal, which would explain the extra discs in the trunk. I'll go over the brakes thoroughly at some point, it seems warranted! Other minor problems noted were that the clock doesn't run, the intermittent wipers don't work, nor does the auto-parking function work, you have to time turning off the wipers just right for them to be in the parked position. Also, the car needs motor mounts, I'm getting motor noise coupled into the body. And the heater fan squeaks some. That's easy to fix, at least. Also, there is green coolant in it and the auxiliary fan is always running, and it runs cool according to the gauge. The driver's courtesy light switch doesn't work, nor does the trunk light. The lamp-out warning is lit. None of these things are disturbing, or likely even very hard to fix. I stopped and put some gas in the car, enough to put out the low fuel light (so that works too). Then I drove back to work. We'll shuttle the car home later.